Stone carving It is the ancient art of cutting natural rough rocks or stones into utility and decorative items. The end products are permanent and are least affected by forces of nature. Thousands of year old remains of rock cut artifacts have been excavated by the historians and archeologists depicting the existence of this art form from time unknown. Stone carving has been found to exist in almost all parts of the world. The raw material used depends on the local availability of the same. Compared to some art forms, where the end products can be modified, this form of the craft leaves little or no scope of rectification. The end product has to be made in a single attempt and needs a lot of skill and dexterity. 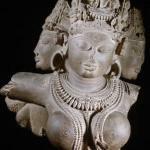 Carved stone figures of gods and goddesses are found at Durgi, Allagadda, and Tirupati. Locally available soft stone is used to carve stone figures.